Tales of the Cocktail 2010 Day Three, at least I’m pretty sure it’s day three. It’s starting to blur together. This morning is my turn to be a bit lost to the world. I am in a bit of a towel induced fugue, I miss a tasting room or two, maybe it was three, who knows anymore. I slowly pry myself out of bed and sit in the shower for a good 15 minutes, very thankful that I have a stock of water, Gatorade, and 5-Hour Energy in my room. 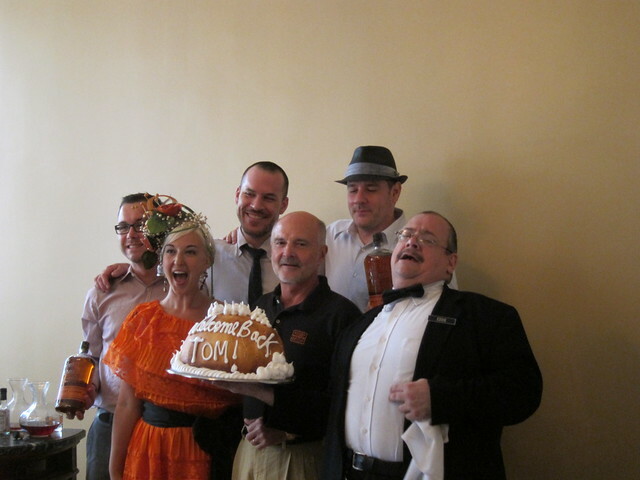 I fortify myself, grab a slug of rum and then make my way to Antoine’s for a lunch hosted by Bulleit Bourbon. Into my haze comes the bright whirlwind of awesome called Hollis Bulleit. Remember the song Jump in the Line made famous by Harry Belafonte in Bettlejuice? She’s definitely a hurricane in all kinds of weather, she sweeps into a room and instantly the energy level is turned up to eleven.